Mississippi in 2010. Photograph taken by the author. 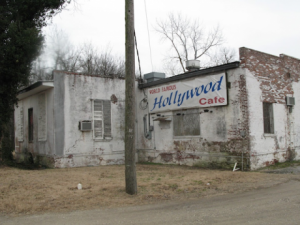 Sacrifice zones – abandoned, economically shattered places – are spreading in historically white rural areas and small towns across the United States. Rural decline fosters regressive authoritarian politics. ‘The United States is coming to resemble two separate countries, one rural and one urban,’ political analyst David Graham proclaimed in a 2017 article in The Atlantic. Viewing the map of 2016 presidential election results, it is hard to avoid a similar conclusion. Donald Trump carried over 2,500 largely rural counties and Hillary Clinton, who won the popular vote, less than 500 mostly urban ones. The ‘two countries’ thesis echoes scholars of uneven development going back decades, from Michael Lipton’s study of ‘urban bias’ to Cynthia Duncan’s Worlds Apart and – more recently – Katherine Cramer’s The Politics of Resentment. Too often now, though, ‘rural’ has become a synecdoche for ‘Trump voters,’ ‘working-class’ or ‘white’ – misrepresentations that Samantha Bee demolished in hilarious video interviews with small-town minority voters. In fact, Trump voters had a higher median income than Clinton voters, reflecting backing among affluent whites without university degrees, many of them business owners in suburban counties. Multiple studies point to racial resentment as the strongest predictor of voting for Trump’s brand of bigotry, faux populism and economic nationalism. Racial anger intensified in the lead-up to 2016 not just because the US had an African American president, but also from an accelerated decomposition of community life and livelihoods that many whites worried could reduce them to what they imagined as the level of Blacks and other minorities. It drew on a deep historical well of entrenched racism and anti-Native and anti-Black violence. These whites feared that the hopelessness and decay of the country’s rural and urban ‘sacrifice zones’ was spreading. Chris Hedges described ‘sacrifice zones’ as places where ‘the marketplace rules without constraints, where human beings and the natural world are used and then discarded to maximize profit’. White privilege had many dimensions – decent wages in largely industrial employment, defined-benefits pensions, seemingly permanent jobs – but these began to unravel in the neoliberal 1980s and imploded during the Great Recession of 2008. The punditry and media didn’t grasp the enormity of these transformations because so many analyses were piecemeal, examining home foreclosures but not the opioid epidemic, or deindustrialization and unemployment, but not the disappearance of locally-owned financial institutions. They also failed to place US decline in global and historical perspective, rarely asking why in one of the richest nations people did not enjoy the right to health or a dignified retirement. After the mid-1970s wages decoupled from productivity gains and stagnated. Internationally, the key factor was the mid-1970s collapse of the Bretton Woods framework, which since 1944 had promoted protected national economies, and the subsequent ‘opening up’ of international finance and trade. Domestically, attacks on unions, particularly once Ronald Reagan became president in 1981, further eroded workers’ bargaining power. Income and wealth inequality soared. By 2016, 63 percent of Americans didn’t have enough savings to cover a $500 emergency. Today, nine million have zero cash income. The divide had a pronounced racial dimension. In 2014, the median earnings gap between black and white men, which narrowed sharply in 1940-1970, was larger than in 1950. One striking finding of Cramer’s Politics of Resentment was that rural Wisconsinites viewed the 2008 Great Recession as ‘unremarkable’. They had been living in a recession for decades. The economic precarity of low-income Americans is such that the cost of a car repair may initiate a downward spiral that culminates in job loss and even homelessness. Nationally, residential foreclosures – 383,037 in 2006 – climbed rapidly, with around one million each year in 2009-2012. The cumulative impact was devastating, as families doubled up with relatives, went on the road, or moved to shelters. Some features of US sacrifice zones are specifically rural. The 1980s saw the worst farm crisis since the 1930s depression. Petroleum and fertilizer costs skyrocketed, grain prices plummeted, and interest rates climbed, as monetary policies sought to dampen inflation and loans were called in. The rapid consolidation of input and machinery suppliers, and in the processing, brokering and exporting of key commodities, allowed a handful of giant corporations to garner a rising share of the total value-added between the farm gate and the consumer. Survivors of the 1980s suffered a second crisis in the past five years, following the end of the commodities boom of the 2000s. In 2013-2016 US farmers and ranchers experienced a 52 percent drop in real net farm income, the largest three-year decline since the 1930s depression. Over half of farm households now lose money on farming. As farmers again go bankrupt, the multiplier effects further destabilize local economies. Populist demagogues like Trump blame job loss exclusively on free trade and factory flight: their liberal critics also cite automation. But financialization has clearly been a central factor. In the 1980s leveraged buyout specialists loaded companies with debt, dismembered them, slashed wages and pensions, and cashed out. One small-town Ohio manufacturer even ordered executives to live elsewhere, ‘so they wouldn’t be troubled by requests for civic involvement or charitable contributions’. Big investors also targeted mutually-owned banks, which long powered small-town economies. Directors often donated to local institutions and sometimes made loans based on trust rather than credit scores. As giant financial institutions took over, they sucked wealth out of communities, instituting stricter lending criteria, undermining small businesses, creating ‘banking deserts’, and forcing the newly un-banked into high-cost check cashing outlets and payday lenders, themselves frequently financed by large banks. During 2008-2016, rural areas, which have less access to broadband and Internet banking, saw 86 new banking deserts. Like mutual banks, cooperatives and credit unions that reinvested locally the wealth communities produced had constituted a bulwark against rapacious corporations and financial institutions. Of the 3,346 agricultural cooperatives – grain elevators and packing houses, among others – that existed in 2000, 1,350 closed by 2015. Of the more than 8,000 credit unions in 2007, over two thousand closed by 2017. Family-owned stores and diners on small-town Main Streets were sites of human contact, invested profits locally, and provided income and employment for farm and other rural households. As malls and chain stores proliferated, such businesses withered from relentless competition. Fewer small businesses means less ad revenue for local newspapers, thousands of which closed in recent decades, some succumbing to the Internet and others to the same financialization that was strangling industries and banks. More recently, low-wage retail and service jobs in chains and malls began to disappear because of e-commerce. Empty storefronts and malls and vanished newspapers are not just signs of job loss and economic precarity. Inhabitants of sacrifice zones read them as stark, painful reminders of abandonment and a shredded social fabric. In recent decades, federal and state governments have removed funding from social services of all kinds. Rural hospital closures doubled between 2011-12 and 2013-14. Post offices are closing too. They have long been lifelines for rural people, serving as meeting places, delivering essential medicines, information, and human contact. Because property taxes are a main source of education funding, when tax bases and populations decline, schools – typically centers of small-town sociality – close, cut back or consolidate with adjacent districts. Thirty percent of all school closures nationwide in 2011-12 were in rural areas. Most recently, the Trump administration let funding lapse for community health centers used by 26 million Americans. As once vital communities and neighbourhoods hollowed out, losing their institutions and the capacity to appropriate the wealth that they produce, despair and anxiety triggered violence and addiction. Economist Umair Haque, in a trenchant essay on the ‘social pathologies of collapse’ – school shootings, the opioid epidemic, ‘nomadic retirees’ who live in their cars and work low-wage jobs, and the normalization of indifference – concludes that ‘we are grossly underestimating what pundits call the “human toll”’. The scale of the opioid problem – and of the physical and emotional pain behind it – is staggering. In 2015, some 92 million or 38 percent of US adults used prescription opioids, with 11.5 million (4.7 percent) reporting misuse. In 2008-2017 drug companies shipped 20.8 million opioid pills to just two pharmacies in one town – population 2,900 – in largely rural West Virginia. Drug overdoses now kill more people than gun violence and auto accidents combined. In the 2016 election Trump performed best in counties with the highest drug, alcohol and suicide mortality rates. In 2017, for the second year in a row, life expectancy in the US fell, in significant part because of opioid overdoses and other ‘deaths of despair’. Farmers, in particular, are killing themselves in record numbers. Trump discerned the anger, fear and alienation in the sacrifice zones, but directed his racist, anti-immigrant harangues only at their white inhabitants. His country-club racism, off-hand authoritarianism, simple-minded nationalism, overblown promises, and claims to be a ‘strong leader’ resonate in shattered communities, as well as among nouveau-riche entrepreneurs and well-to-do white suburbanites, many of whom bought Republican claims about ‘burdensome’ regulation of business and were uneasy that their heretofore monochromatic communities were being ‘invaded’ by affluent immigrants and people of colour. Trump repeatedly pathologised non-white inhabitants of the sacrifice zones, deploying age-old right-wing tropes about ‘undeserving’ minorities that in turn served to justify the traditional conservative agenda of shrinking government and protecting the interests of the super-rich. Governments appeared unable or unwilling to address the convergence of multiple crises –employment, housing, education, health, decaying communities – and this revived memories of past broken promises, including those of neoliberal Democratic administrations. This feeling of abandonment, along with downward mobility, made white rural Americans receptive to a candidate who cast himself as an ‘outsider’. In the Emancipatory Rural Politics Initiative, activists and researchers are debating pressing questions. Should the resistance in the US try to win over Trump supporters, or is it better to work on combatting voter suppression, particularly of minorities, fighting for campaign finance reform, and mobilizing the vast numbers that abstain from electoral participation? In the #MeToo–Stormy Daniels moment, will white evangelical and white women voters drop their support for the crude, misogynist, philandering president? Or does having a pliable, if mercurial, conservative, racist ally in the White House trump all other considerations? To what degree is global and US authoritarian populism a façade for a state-led project that invokes ‘family values’, retrograde forms of masculinity and heteronormativity, and an exclusionary vision of the nation in order to exacerbate social divisions, roll back social conquests, and intensify exploitation of human beings and the environment? Is it possible to re-legitimize the public sphere and public investment, funded by progressive taxation, to create a stable and more just society that provides opportunities for all? To what extent are the world’s autocrats – Trump, Duterte, Erdoğan, Modi, Orbán, Putin, among others – simply a mutually reinforcing collection of erratic rulers? Or are they taking shape as a global authoritarian populist axis? And finally, can movements in different countries learn from each other to resist the authoritarian wave? Originally published by openDemocracy under a Creative Commons Attribution-NonCommercial 4.0 International licence.